I finally got something crafty done! I am simply amazed it happened. Okay the only reason it happened is because I have to wait for the acid stuff in the pool to start working and I can't get in it yet so I was stuck trying to find something to do. 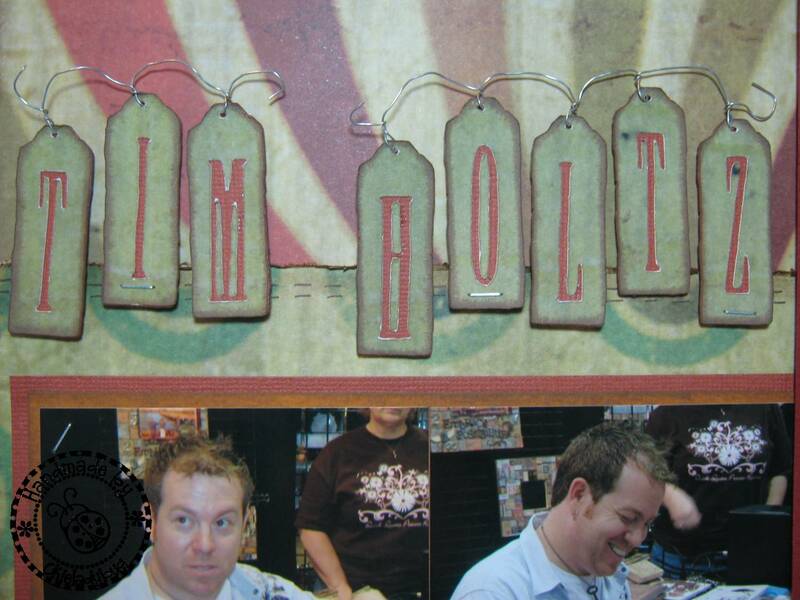 Of course you guys recognize Tim Holtz, Mr. Grunge himself! I got to see him in action at the GASC last year. For the name I used Stamped and I used Design Studio to hide the contour on the burnt orange cardstock and then layered the letters on top. I strung the tags on floral wire and gave it a little twist at the top. 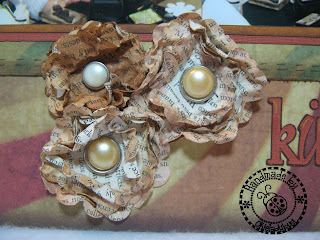 I also added a few of the Tim Holtz mini staples on a few of the tags. I forgot to take a close up shot of the "king of grunge" but it was done with Printing Press. Both Stamped and Printing Press are retired now, and I am so glad I have them! I love these fonts! If you have rewards points and like Printing Press it is available for 800 points, just click HERE to see. The book flowers are some I had made a few months back and I actually used them because I was too lazy to look for something else to embellish the page with. I have plenty of scallop circles punched out to make some more of these flowers but I haven't gotten around to making up a stash of them. That might be something I can do next week when I feel like making something. For those who are wondering about the pool update...well it was very cloudy so I had to add some acid to bring down the PH level. The instructions say to wait 24 hours to see if the pool clears, I am not a patient person and I want it clear LAST WEEK. But I am trying to be good and do as instructed *okie figures that needs to be written down on the calendar*. I certainly hope the pool is good to go by this evening as my friend Nancy is coming over to swim. I am going to make some shish-ka-bobs on the grill, at least that is my plan. Dang that means I need to go to the grocery store after going for my platelet donation! UGH! I hate the grocery store!! You forgot to journal on the page that Karen and I almost had to bodily remove you from TH's booth that day. Your drool was making a big puddle in the aisle! LOL! The flowers look really good on this, perfectly grungy so very appropriate. I think the title of yesterday's post would have been just a perfect title for today's also...(at least for me anyway) Who doesn't love TH and all of his awesome products? Have a great weekend in your pool! I think you made Tim proud. Great and very fitting layout. Why is everytime you need a pool to be ready by a certain day or time the Big Cloudy raises his head? WOW! What a fabulous LO! Great details ... You've really done Tim Holtz proud with this amazing page. In fact, I think you should send Tim a copy ... 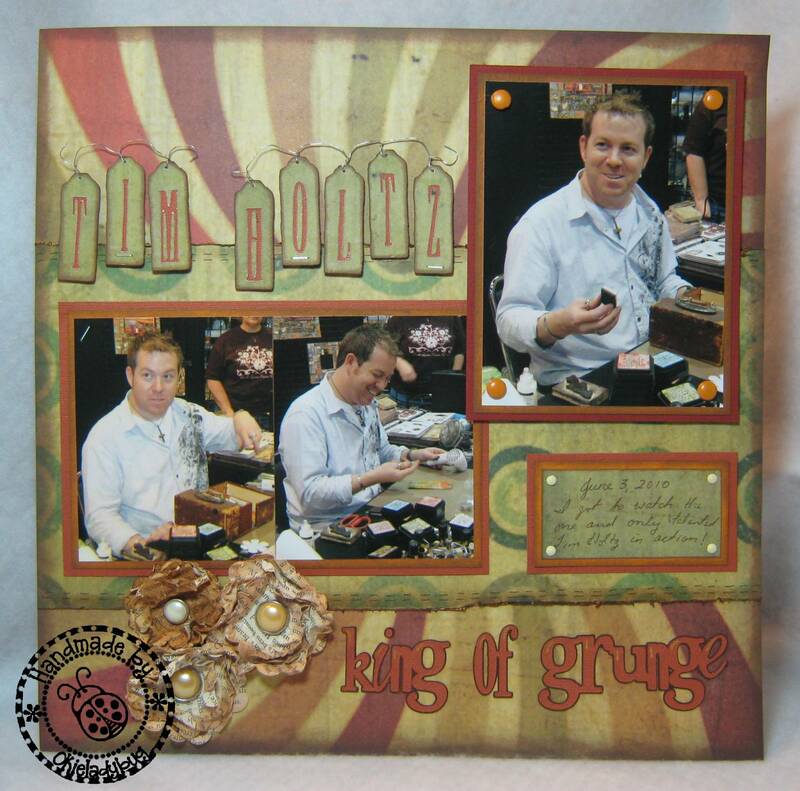 I have no doubt that the "King of Grung" would be really tickled over this awesome tribute! I love the flowers!!! Linda's comment about the puddle of drool is hilarious! I guess you are doing a lot of swimming and not so much scrappin'...miss your posts! LOL! This is just perfect for TH! I'm sure he'd love it! Very nice layout. You are too honest, Okie. 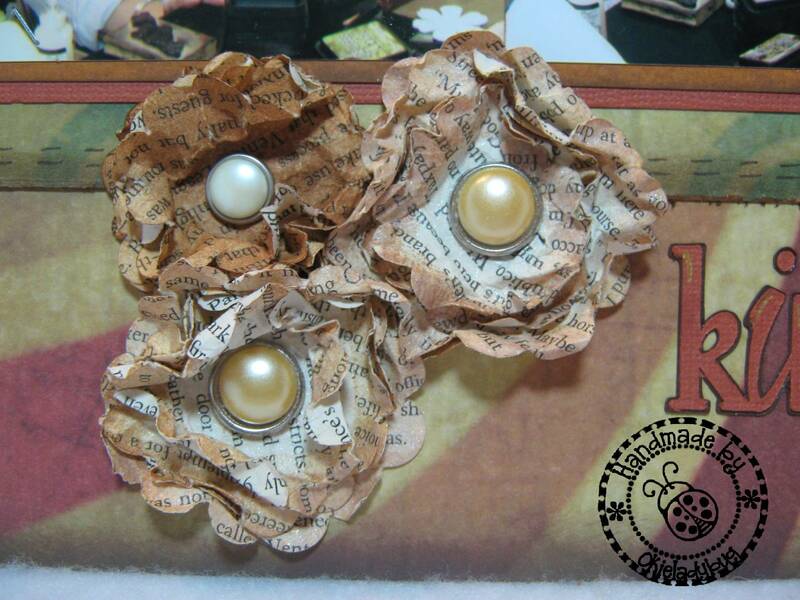 Loved your comment about being too lazy to look for other embellishments so you used the flowers! Funny lady. Love the flowers. Have fun at CKC. I THINK I AM IN LOVE!! I really need to make something! Father's Day - Card, Box and Cake! I think I am about locked and loaded!! This blog should be scrapbooked! !